I need to apologize for the lateness of this final article on the 2017 College Football Season. But in all fairness after Monday Night’s Championship game I could thread a sewing machine with it running up until late yesterday afternoon. The answer to that question is quite simple my dear readers….. “&^%$#@!!! What the %$#@! I can’t %^$#@* Believe &^%$#@! This certainly won’t be the most pointed or definitive collection of statements concerning the great Keith Jackson, but they very well be the most sincere. Last Friday, the Greatest voice in all of sports in general and in college football specifically passed away after a long illness at the age of eighty nine years old. During all his years of commentating college football games he never once said…. 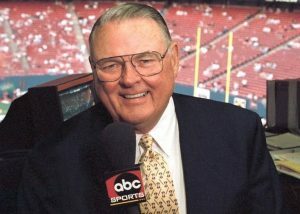 Keith Jackson’s South Georgia accent and his way with words and phrases set him apart from all his colleagues at the time and if I had my way, every college football commentator today would have to watch a thousand hours of games with Keith Jackson calling the games before they ever stepped foot in the booth. I loved the way Keith Jackson said Alabama, because it always sounded like…. His iconic phrases of “FUMM-BLE” and WOOOOO Nellie” and others…. Today we have “commentators” that criticize players, coaches, and everything under the sun; they are “experts” about every damn thing. And speaking for myself there are too many “commentators” to mention today that I go after the mute button on the remote control faster than a gunfighter in a Clint Eastwood western as soon as I hear their voice. “IF” Keith Jackson were commentating on turtle race I would have tuned in and listened and watched, because he was Keith Jackson and he made it worthwhile. From Coach Bryant, to Coach Darrell K, Royal to Wayne Woodrow Hayes and Bo, they all loved him, respected him and trusted him. Maybe it’s just me, but I like to think and believe that Keith Jackson lived just long enough to witness Alabama win another Championship, as I am sure in his minds eye he saw the man in the hounds tooth hat with the rolled up program in his hand on the sidelines and the thoughts during the game of the many memories they once shared together. Keith Jackson, a Marine from Georgia, a Southern Gentleman, thank you for all the wonderful memories of days, games and times gone by. There will never (Ever) be another one like you. Your Favorite College Football Prognosticator went 2-0 for the Championship Week, Picking both the Mighty North Dakota State Bison and the Alabama Crimson Tide. I want to assure my Clemson Family that you “Will” be back in the Final Four next year. My hurting Georgia Bulldog Faithful, the same goes for you barking dogs. To My Oklahoma Sooners readers, we will see you in the mix as well next year despite having Tim McGraw as your Head Football Coach. EDITORS NOTE: Don’t doubt me on this one. Have you ever seen them together? Now before we move on I need to answer some of the myriad of emails I got this week. “That game doesn’t count! Auburn beat both of those teams! EDITORS NOTE: Well, at least you have fond memories of the Peach Bowl…. EDITORS NOTE: A raccoon can whip a dog and a dog can whip a possum and a possum can whip a raccoon, so what’s your point? EDITORS NOTE: Look at the bright side; at least you didn’t get shut out three years in a row in the playoffs. EDITORS NOTE: I bet you have a “Trump is NOT my President T-shirt too don’t you? EDITORS NOTE: You are starting to sound a lot like your dumbass coach, just saying. EDITORS NOTE: I’m certainly not an odds maker, just a simple terribly famous and successful college football prognosticator, but I would say that I have better chance of winning the Publishers Clearing House Sweepstakes than Coach Jim (Butch) Harbaugh (Jones) does of getting to the college football playoffs. As for the Championship game between Alabama and Georgia, it’s difficult to recap in words but my good friend from Birmingham, Alabama Jermaine “Funnymaine” Johnson has perhaps the best take on the action from the game. All the confetti has been swept from the floor of the Mercedes Benz Dome in Atlanta and nobody understands the pain and disappointment of Georgia fans quite like Alabama fans who suffered the same fate at the hands of the Mighty Clemson Tigers last year. Like it or hate it, the Championship was a Battle of Brothers in the Southeastern Conference and although the Mighty Bulldogs came up one play short, they had an unbelievable and unlikely season and a Conference Championship to go along with their many accomplishments. Congratulations to the Bulldogs of Georgia, I am sure we will see you again. I don’t mind admitting when I am wrong and couldn’t be more pleased that the Mighty Bison defeated the James Madison Dukes in the Championship game. It was a thriller and if you didn’t see it, you missed one heck of a football game. In case you were wondering, The North Dakota State Bison have won SIX of the last Championships. Let that one sink in for a minute. So that’s a wrap my friends of the 2017 College Football Season….. It been full of joy, tears, disappointment, heartache and elation…. Ironically that wide spectrum of emotions sounds exactly like a story I’m writing about my experience during my Senior Prom, never mind, forget I mentioned it. I will apparently be trapped here at the RTR Farm with My Black Lab “Doc” in yet another of the Siberian Winter Blasts that have blown through the area yet again. And on an unrelated side note, “IF” I get another damn email about how this Siberian subzero weather is caused by “Global Warming” I am going to stick their head in a damn oven and turn it to broil and let them figure it out. This unfortunate turn in the weather will allow you all to enjoy a “new” story on Mikerights.com next week, providing of course Doc and I don’t lose electricity. Thank you all once again for reading both websites and riding along with me throughout the college football season. I can’t begin to tell you how much I appreciate all your encouraging words about my book “Sunnyside Up”. Your kind words have made some very dark days this past year quite sunny; “Thank you” for bringing the Sunshine to my life; I appreciate it, more than I can say.